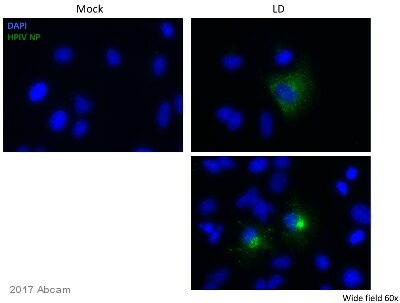 This antibody reacts with nucleocapsid protein of human parainfluenza virus type 1 (hPIV-1). It does not cross-react with nucleocapsid proteins of Sendai virus and human parainfluenza virus type 3 (hPIV-3), neither does it react with nucleocapsid proteins of measles, mumps, Menangle, Nipah, and Hendra viruses. Recombinant full length protein corresponding to Parainfluenza Virus type 1 nucleocapsid. Our Abpromise guarantee covers the use of ab34752 in the following tested applications. WB 1/1000 - 1/5000. Predicted molecular weight: 58 kDa. Human parainfluenza viruses (HPIV) were first discovered in the late 1950s. HPIV is genetically and antigenically divided into types 1 to 4. HPIV 1 to HPIV 3 are major causes of lower respiratory infections in infants, young children, the immunocompromised, the chronically ill, and the elderly. Each subtype can cause somewhat unique clinical diseases in different hosts. HPIV are enveloped and of medium size (150 to 250 nm), and their RNA genome is in the negative sense. These viruses belong to the Paramyxoviridae family, one of the largest and most rapidly growing groups of viruses causing significant human and veterinary disease. HPIV are closely related to recently discovered megamyxoviruses (Hendra and Nipah viruses) and metapneumovirus. Parainfluenza viruses are enveloped viruses with a negative strand, ~15 500 nucleotide-long nonsegmented RNA genome which encodes two envelope glycoproteins, the haemagglutinin-neuraminidase (HN), and the fusion protein (F, itself cleaved into F1 and F2 subunits), a matrix protein (M), a nucleocapsid protein (N) and several nonstructural proteins including the viral replicase (L). Immunoblot of recombinant nucleocapsid protein (NP) of human parainfluenza virus type 1 (hPIV-1) ab34752 at a concentration of 1 µg/ml. lanes 6-8: lysates with recombinant NP of Menangle (6), Hendra (7) and Nipah (8) viruses. Panel A : SDS-PAGE, Coomasie staining, B: immunoblot with ab34752. ab34752 has not yet been referenced specifically in any publications. Publishing research using ab34752? Please let us know so that we can cite the reference in this datasheet.